Obsidian Entertainment, the company that gave us Knights of the Old Republic 2 and Fallout: New Vegas, is working on a South Park RPG. No, it's not April, and yes, this is serious, at least according to GameInformer, which plastered this unexpected bit of news on the cover of its January print issue. Trey Parker and Matt Stone are writing the script, performing dialog and overseeing the development of a full-on South Park RPG in collaboration with THQ and Obsidian. 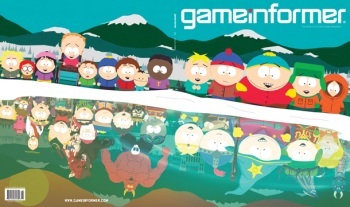 Details are unsurprisingly scant at this point but the game will reportedly put players in the shoes of the new kid in town, where he'll have to make friends and defend South Park from "a wide range of threats." The new game is expected to come out sometime in 2012 for the Xbox 360 and PlayStation 3. And now we've reached the moment at which I admit that I'm baffled by this idea. Not that there's anything inherently wrong with a South Park RPG, I suppose, but it just doesn't seem like the sort of thing that the studio responsible for KOTOR2, Neverwinter Nights 2, Alpha Protocol and Fallout: New Vegas would get into. Am I wrong on that? Work is work and studios have bills to pay, I know, but South Park? I did not see that coming.